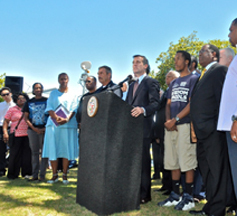 Newly minted Los Angeles Mayor Eric Garcetti followed up his tweets for peace with a full fledge press conference on the lawn of Dorsey High School on Tuesday July 14. Flanked by Los Angeles Police Department Chief Charlie Beck, Supervisor Mark Ridley Thomas, Assembly member Holly Mitchell, LAUSD School Board Member Marguerite LaMotte, Council­members Curren Price and Bernard Parks, Garcetti met with community leaders and educators to request that citizens and protestors remain calm. Beck promised to protect protesters' First Amendment rights, but not at the expense of community safety. He said he preferred his officers make no arrests on Tuesday night, but said they would not tolerate lawbreakers. “You come here again tonight, you will go to jail,” he said. “Your actions will reduce the power of the message from this community, and that is wrong. That is a shameful act,” Beck added. Immediately following the verdict, protestors held a peaceful candlelight vigil at Leimert Park in the Crenshaw District, but over the past couple of days the protestors have caused freeway closures, prevented shoppers from shopping at the Baldwin Hills Crenshaw Mall, altered bus routes and assaulted innocent people. National Civil Rights leader Rev. Al Sharpton has scheduled another march at the Federal Building in downtown Los Angeles, and has insisted that justice advocates continue to march and protest peacefully. Garcetti was back east with relatives when the violence broke and subsequently had to postpone a trip to Washington D.C.